After the second day of dressage Freddie Mac unfortunately dropped down to 15th place so there was plenty of catching up to do. Saturday was greeted with heavy rain as the forecast predicted, and we had all hoped Bramham might get lucky but the rain came in, turning the cross country course into a very testing challenge. The day started really well for me with Chilli jumping a superb clear in the CIC show jumping, which kept him in the lead. It was a good track and he jumped one of his best rounds so I was very happy with him. 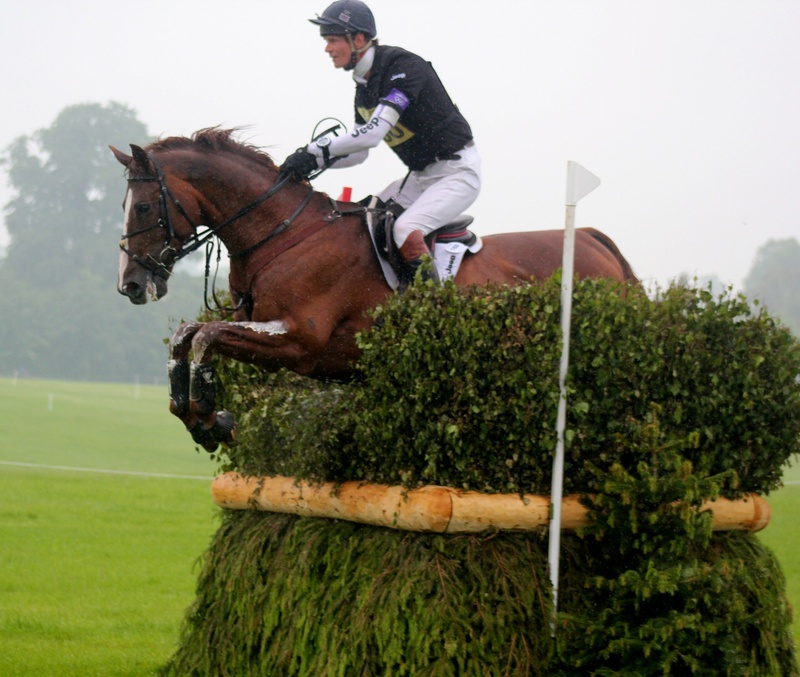 For Freddie Mac I thought the cross country was a big test, certainly the toughest course he has ever seen. I couldn't have been more impressed with how he tackled it. He gave me an excellent ride, without any anxious moments and seemed to take it all in very maturely. He galloped very easily and finished well, just incurring 1.6 time faults. At the end of the cross country he had moved up to 7th place which was fantastic, particularly as the course had caused so much trouble. However I was slightly regretting my time faults, without which he would have been in 2nd! Chilli had to wait until mid afternoon for his cross country, and despite persistent rain the ground held up pretty well. He gave me a great ride with just 5.6 time faults to win by a comfortable 9 marks. He was one of the most experienced horses in the section so I was very much hoping for a good performance. He does seem to love Bramham. Freddie Mac looked very well on Sunday morning, very on his toes and pleased with himself. The show jumping course was a big track and the ground had got very soft, so it was a real test for all of the horses, and caused plenty of trouble. However Freddie Mac jumped a superb clear inside the time to move up to 3rd place which was as good a result as I could have hoped for. His owners Lindy Best and Jane Kier had a most enjoyable week, with Lindy realising a lifetime dream of having a horse compete at Bramham - her local event. The Bramham team did the most terrific job dealing with the conditions. Every lorry had to be towed into the lorry park on Wednesday, and they worked through the night to put the ground right again for the show jumping. Everyone there is incredibly friendly and nothing is too much trouble, and this year the buggy service was fantastic! The Lane Fox family deserve huge thanks for allowing us all to be there, I hope the beautiful park recovers before long, certainly in time for the Leeds festival. Thanks to Samantha Clark for the great photos.